That America is once again a good place to build cars is born out by the fact Toyota exported 124,000 US built vehicles to 21 different countries in 2012 – a figure they plan to expand upon this year. The company’s export level last year was up 45 percent and 2013 will see up to 5,000 US built Venza models fabricated expressly for shipment to Russia and Ukraine. 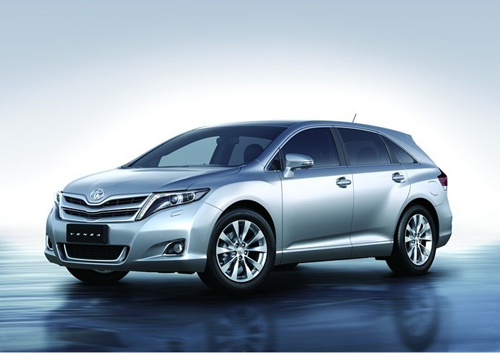 The Venza has always been built in America, having been designed specifically for this market. More than 70 percent of Venza’s components come from North American suppliers. The US exports to Russia will occur over the next year of production. The Venzas are built at the company’s Georgetown KY. plant, where 6,600 US workers benefit from the company’s $6 billion investment in the plant and related facilities. The Georgetown plant is the company’s largest manufacturing facility outside of Japan. The vehicles will be shipped out of Brunswick GA. The versatile five-door, five passenger liftback crossover sold 43,095 units in the US during 2012, a 10.8 percent jump over the previous year. It is available with a 2.7-liter four-cylinder or a 3.5-liter six-cylinder engine in both front or all-wheel-drive models. The combined mileage ratings are 23 for the four-cylinder FWD version and 21 for the six-cylinder AWD model. The Venza’s base price ranges from $22,235 for the L grade four-cylinder to $30,465 for the Camry XLE V6 automatic. The sales in Russia and Ukraine should push the total of US built Venza models over 50,000, with just a modest increase in domestic sales. “Toyota is constantly working to identify and expand new export opportunities for the vehicles we produce here, building on our extensive investments in auto production, research and development and helping to maintain a strong, stable base of jobs,” added Moreno. “With this development and other possible achievements in the future, we hope to continue boosting exports from our U.S. operations”.